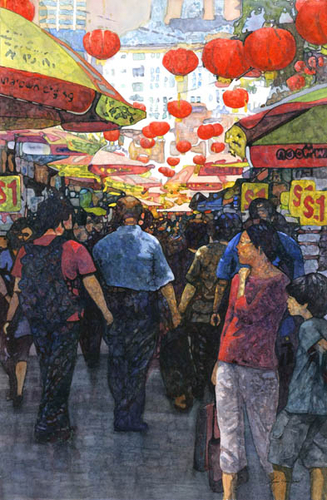 A Chinese market scene with canopies, lanterns and receding shoppers. I have used Intense primary colors to express the atmosphere, the hustle, bustle and excitement of the experience and the light at that moment. I visited Singapore during the monsoon and we had rain storms nearly every afternoon. The rain lasted for a short period of time and this is the light that appeared just as the rain stopped, the clouds cleared and the sun returned. The only colors I duplicated are the lanterns, the people, clothing and umbrellas are colors I chose to unify the scene. This award-winning painting won a merit prize at Virginia Watercolor Society Annual Juried Show, 2011. The size you see here is image size. The price of the original painting includes off-white cotton rag mat, cotton rag foam core backing, ready to insert in the frame of your choice. The framing adds approximately 8" to the height and the width.